November Is Diabetes Awareness Month, Diabetes and amputation. People with diabetes are at a much higher likelihood of having parts of their feet and/or leg amputated than other people. The reason is that people with diabetes can suffer from peripheral arterial disease which reduces blood flow to the feet and peripheral neuropathy which reduces feeling to the feet. Together these conditions make it easy for a patient to get ulcers (breaks in the skin) that lead to infection and difficulty healing. 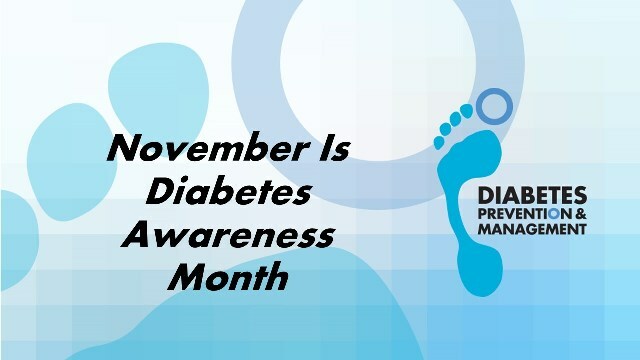 Proper foot care, control of blood sugars, and proper shoe gear can help prevent a person with diabetes from having to have an amputation. Smoking adds to the threat of amputation by destroying the small blood vessels in the feet, slowing the healing of wounds as well.